Without a doubt, one of the most common questions I am asked is on whether or not alcohol consumption is a good idea. And what I have determined, after a fairly extensive review of scientific literature, is that the answer to this question is “it depends”, and you will see why. Before we get to the relationship of alcohol to brain health, let’s first take a look at what the research tells us about the relationship between alcohol consumption and cardiovascular disease. The dangers of heavy alcohol consumption from a health perspective have been studied and described for centuries. Heavy drinking, as it relates to heart health, is clearly associated with damage to the heart muscle, elevated blood pressure, stroke, and heart rhythm abnormalities. These health risks stand in contrast to the body of research that shows the potential health benefits of light to moderate alcohol consumption, such as a reduced risk of cardiovascular problems like coronary artery disease. In this review, the author determined that light alcohol consumption was less than three drinks per day. That means three cocktails, glasses of wine, or glasses of beer. Heavy alcohol consumption would be more than 3 standard servings per day. In attempting to understand why low-levels of alcohol consumption might actually be heart protective, the authors described several mechanisms that may be in play. Alcohol is known to raise HDL cholesterol, the “good cholesterol”. Low levels of alcohol consumption help reduce the stickiness of platelets in the blood. This may well prove helpful with respect to stroke as well as coronary artery disease. And finally, the authors did report that low levels of alcohol consumption are associated with decreased psychosocial stress. And this turns out to be very important, as we now recognize that psychosocial stress is associated with a variety of health risks well beyond the heart. What we see in this graph is an actual reduction of risk for coronary artery disease as alcohol consumption increases, but only up to a certain point. Thereafter, higher levels of alcohol consumption are associated with an actual increase in risk, and this increase continues right along with increasing alcohol consumption. So again, we are able to identify the “sweet spot,” shown here with the blue arrow. At least in this study, it looks like around 24 g of alcohol per day would be ideal. This is the amount of alcohol in 24 oz of regular beer, 10 oz of wine, or 3.0 oz of distilled spirits. As alcohol consumption relates to the brain, we are fortunate that there have been some recent and incredibly extensive reviews of this interesting topic. For example, a new study recently appeared in the Journal, Frontiers in Nutrition that provides a comprehensive review of the role of alcohol in brain health and disease risk and also tries to tease apart the actual type of alcohol that is consumed in terms of how it relates to these issues. This is a powerful publication that sighted 182 references. 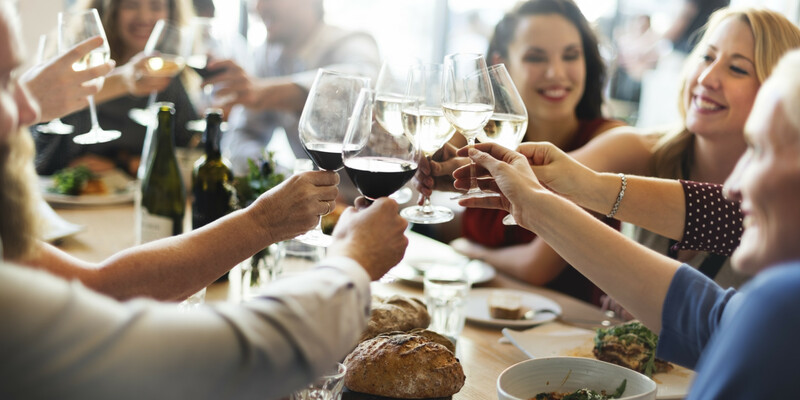 Overall, this extensive report made quite clear that there are some very positive benefits for the brain with low to moderate alcohol consumption, especially as it relates to red wine. The report goes on to provide a large number of possible mechanisms by which red wine benefits the brain, which includes over 500 different compounds that have been identified in wines. These compounds include a large number of polyphenols, which are biologically active phytonutrients that provide us important antioxidant protection and also nurture our gut microbes. Polyphenols also work to reduce inflammation, a process that has been recognized as a pivotal player in brain degeneration. In addition, polyphenols found in red wine have been recently identified as having iron-chelating activity, meaning they can help reduce the presence of iron that might otherwise increase free radical type damage. Free radicals are damaging molecules that can inflict injury to proteins, fats, and even our DNA. Finally, the authors indicated that other polyphenols found in red wine might actually help reduce the formation of amyloid protein in the brain. This is the abnormal brain protein that has been associated with Alzheimer’s disease and is the subject of aggressive pharmaceutical research. Is Alcohol a Healthy Choice? So how does all of this interesting science inform us in terms of what we should do as it relates to drinking alcohol? I’d say that the evidence presented by these researchers is quite clear that there is a benefit to low to moderate alcohol consumption. We live in a world where we often consider that if something is good, then more of it is better, but that mentality flies in the face of what is actually revealed by the scientific data. The U-shaped curve graphs clearly show us that, at least as it relates to alcohol, there truly is a sweet spot in terms of your heart, brain, and overall health. Consuming a maximum of two or three glasses of wine per day (preferably red) seems to be associated with health benefits not only for the heart but for the brain as well. Choosing a low-alcohol wine (12.5% or less) can reduce the potential downsides of alcohol consumption. Wine should be organic and biodynamically farmed. These wines will be free of pesticides, herbicides, and other chemicals that pose a risk to our health. Choose a wine that is free of additives. Did you know the FDA allows 76 different additives to be added to wines without being labeled? As with any food in your diet (and you knew this was coming), you should absolutely check the sugar content of the wines you consume. There are wines available now that are specifically tested for fructose and glucose (sugars). Look for wines that have less than 1g of sugar per liter.